North West Night League prizes for John and Chris Embrey. Congratulations to our member John Embrey, and to son Chris (MDOC), on winning prizes in their classes in the North West Night League 2014-15. This season's fun starts on Saturday 28 November at Sizergh Castle near Kendal, details here. British Schools Champs results and our newer juniors. Good results from 3 Deeside juniors at Sandringham recently – Hannah Hateley 1st in G10, Connor Smith 5th in B12 and Katie Wilson 6th in G8. Just one bad control from Connor and Katie knocked them off the podium so hard luck to them. Other junior news is that we seem to be slowly increasing our numbers again, so hopefully the younger brigade will stay with us as they develop and we should start thinking about some junior sessions again after a bit of a lull. Please get to know them and give help whenever possible (none of their parents are orienteers - yet) – at Hightown, we had Elizabeth Goodwin of West Kirby (G9), Seren Dovey-Evans of St Brigids (G7) on orange and Jacob (M8) and Daniel (M6) Shanahan and Robin Glover (M7) on yellow along with their parents. The Shanahans came to some SEE’s this year and the Glovers (who have relations in WCOC) came along later in the summer. Forty members sat down to a two-course meal and drinks in the Lord Binning, Kelsall for the Sandstone Trail Social. This marked the 39th running of the Sandstone Trail Race by the Club, and helpers from the race day received a subsidised meal as thanks for their contribution. You can see photographs of the social here. Thanks go to Jill Barnes for organising a very successful Social. The DEE event in the North West Night League will now be held at Little Budworth. This will give much better night orienteering than the previous venue, and we hope to see a good turnout from Deeside. The evening start will be quite late (probably from 19:30), so there will be plenty of opportunity for rest & recuperation between the two events! Great news - we finished 3rd in this year's National UK Orienteering League Club Competition and had 14 top 10 places in the individual competition. plus any 3 additional scores. Each team must include at least 5 men and 5 women. Sounds complicated but shows that orienteering is truly a sport for all ages. Lots more results, plus the 2016 Event Schedule, on the UK Orienteering League website. Winter Weekend - book now! Proposed for 19-21st Feb at Arnside Hostel. If you haven't received details via a yahoo group email, please contact Mike Smithard (smithardm@btinternet.com) Tel. 01244 380565 for them asap. First closing date for bookings for this often sunny and/or snowy club weekend is Monday 2nd November. Good luck to Hannah Hateley and Saskia Jones who head over to Northern Ireland this weekend for the Junior Home Internationals, representing England and Wales respectively. This year's Junior Inter Regional Championships were held on Cannock Chase at the end of September. Hannah and Lachlan Chavasse contributed to a strong second place for NWOA behind the all conquering SOA team, with Saskia helping WOA to 8th out of the 12 regions. We are sorry to report that Pat Spoonley died on Sunday 11 October. Our thoughts are with Brian, Rachel and David. The funeral service is on Thursday 22 October, 1:30pm at Christ Church, Willaston followed by Landican Crematorium, Woodchurch. There will be a small gathering afterwards at The Sheiling, 19 Hooton Road, Willaston, CH64 1SE. Family flowers only, donations to Claire House Children's Hospice. 64 Deesiders are entered for the final at Helsington Barrows on Sunday 18 October. That's nearly twice our entry last year (including, for Deeside, a shocking 5 M21's!) - so, are we going to do as well against stiffer opposition? If your availability has changed or you've forgotten to contact me, let me know and I'll see what I can do. See Mike Smithard's report here. Just announced is the final team for the World Championships - and, the amazing news for Deeside is that both Dave Schorah and Chris Smithard have been selected for the Sprint Relay in Nairn on the Saturday. Congratulations to them both. They will be running with Hollie Orr and Catherine Taylor. This is following the final selection races in Scotland at the weekend. Nail biting time since Sunday morning with the last 2 years performances influencing the decision together with the athletes' own commitment over the last year. Great news and all good wishes to them both. Several more selections now on BOF website and positive indications that 'sprinters' will not run both individual and relay as on successive days and seconds will count in the final of the individual. So, Murray Strain and Kris Jones selected for 'a' sprint - it's up to them which, which means one (?) or two more selections to come, based on record and final selection race on July 12th somewhere within an hour of Inverness. Both Chris and Dave therefore in the frame (as far as I know). Cat Taylor now selected for all races except Individual Sprint. Good luck to our 5-man Harvester team on 27/28th June: John Embrey, Philip Vokes, Rob Normanton and Paul and Lachlan Chavasse. Not qualifying for any of the B race classifications but could be a good battle if 4 or 5 of the top 6 FVO ladies come down. A last-minute rush of entries has given a better look to the race with 25 B entries so far. Final Details for the Harvester here. No more news yet I think. Chris Smithard seems to be back at his former speed with a PB (running off the front of the pack) at the Leeds (Woodhouse Moor) 5k parkrun last Saturday (15.49) but failed to beat either Murray or Chris Jones in Denmark (6th in the Danish Sprint Champs, just behind Murray), again just behind both in his leg time in the World Cup Sprint Relays in Halden, and again behind Chris J, Scott and Murray in the voided WC Sprint race in Sweden after being the leading Brit at halfway, but later having to return to punch at 3 non-contactless ‘contact-less’ controls. A nother race in Stirling this w/e and a possible sprint selection race in early July in Scotland. Dave Schorah was also at the World Cup and was slightly behind Chris in both sprint races. Congrats to Anna Harris who has been invited to join the North West Junior Squad. Despite her appearing at a SEE in a (former) British team O top, she has yet to reach this level. Rumour has it that there are no new M12’s joining – where have all the junior men gone? DEEluded (Chris Calow/Steve Ingleby/Duncan Harris) beat DEEgenerates (Jon Hateley/Malcolm Irvine/John Embrey) by just 9 seconds to take bronze in the M165+ relay at Graythwaite. If Duncan Harris and John Embrey (who both finished, let us say, somewhat behind in the individual) setting off together in first and second place had known who was chasing them on the 3rd leg, they might have collapsed with fright - Charlie Adams SYO, winner of M50 individual, Mark Saunders BOK, winner of M55, Jon Musgrave MAROC, 3rd place M50. The first 2 caught them but not Jon so double congratulations to Duncan and John for 2 great runs on last leg and to Chris Calow and Steve Ingleby (exhausted/invigorated? by his 12 hour day beforehand) for Duncan and Jon and Malcolm for John who set up the finale and commiserations to Jon, Malcolm and John for missing out on a medal. Results for the M165+ relay here. Good news from Sherwood Forest as the 58 Deesiders muster enough points to finish 3rd in the CSC heat and so qualify for the final on 18th October near Kendal. Top scorers were Steve Ingleby, 1st, Sara Campbell and Mike Smithard 2nd and John Embrey and Liz Jackson 3rd. Full results here. Having been soundly walloped by DEE last year, I issue a challenge to come and try to repeat the performance on our home ground, if you dare! A date has been carefully selected by trying to select a weekend when nothing much else is on, 13th June is what we are going for. Final location is not fixed but it is within 1 hour's drive of Manchester. The theme is taking shape nicely and looks like being a drug inspired team event (very) loosely based on Scrabble.....there is a clue to the location in this so get guessing. Please ask your club members to reserve the date. Well done to them, and to the other DEEsiders who competed. We have been allocated to the East Midlands heat at Sherwood Pines (Mansfield) on 15th March against 8 others clubs - so 2 or 3 go through to the final. Entries via Mike Smithard. See next DEENEWS for more details. Lyn Williams, M80 and a former member of DEE, died on 10 January 2015. His son David has sent us these notes. My father Lyn Williams, a former member of DEE, planner of JK84, Mammoth 80 and many subsequent events died in his sleep on Saturday morning. 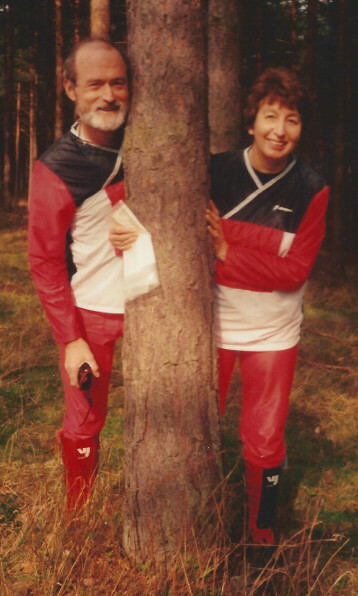 Although Lyn and Joy moved south in the early 2000's I am sure that many of the more senior DEE members will remember my father - as an active orienteer and also, doing what he enjoyed most, a fiendish course planner. The last time I saw my father orienteering was at the 2000 British Champs and subsequent to a ruined fence initiated heavy fall in Fownhope Woods it became clear that something was not quite right. Lyn was later diagnosed with Multiple System Atrophy including Macular Degeneration and, as a result, had been in a nursing home for the last several years. Lyn only managed to beat me once at orienteering (Green Course, Penycloddiau) but his athletic prime was in the late 1950s - cycle time trialling in the West Midlands - notably against Laurie Bradley (future member of Walton Chasers and renowned organiser of the Cannock Chase 1st January Score Event). We are pleased to announce the appointment of Richard Hill as Artistic Director of the newly formed Deeside Orienteering Club Early Music Ensemble. Richard will utilise his experience as a former Club Secretary, as well as in industry, to optimise the exploitation of club resources in the performance of music from (provisionally) c.1400 to 1650.